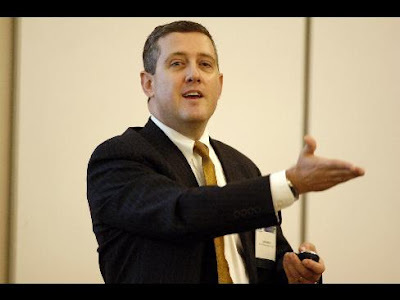 James Bullard, president of the Federal Reserve Bank of St. Louis, wants the Fed to adopt a plan for taming the inflation he expects may follow the end of the recession. Unless the central bank puts a strategy in place and presents it to the public, inflation expectations may run rampant, Bullard says. 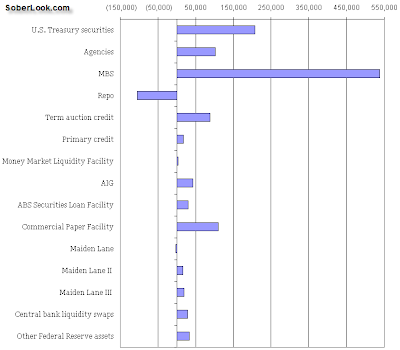 This chart shows the changes from a year ago in the Fed's balance sheet (in $ million). Note that something like Maiden Lane was put on more than a year ago (Bear Stearns), so it shows a small reduction between Jul-23-2008 and Jul-22-2009. A number of people outside the Fed are skeptical about the Fed's ability to start taking stimulus out on a timely basis. Bullard's concern is that even the perception that the Fed lacks the will to fight inflation may create problems, including potentially the worst possible outcome - stagflation.